These are so lovely. Hope your Thanksgiving was special. I would choose the feather/ hope necklace. I always pick up feathers too. Have a good week. They are both beautiful & I truly love the Wish upon a Star necklace! I enjoy reading your posts & seeing what you are making pretty. Best wishes for a long weekend & Happy Holidays! How sweet of you, Becky! I love reading your posts and would love to own one of your necklaces. The feather/hope one is my favorite. Thank you for your generosity. May you and your family enjoy a beautiful Christmas season. Your creations are always lovely. The wish necklace is my favorite. Becky both necklaces are so special but I think I would like to have the Hope one. I’m glad you are enjoying this weekend after thanksgiving in a quiet way instead of buying into all the commercial frenzy. Have a truly blessed weekend with your family! Both necklaces are so, so lovely. I can appreciate them a little differently now because I’ve just started into the world of “creating special jewelry pieces” Wirework is really calling me and I’m enjoying the process slowly working and learning the new techniques. I love your Wish Upon a Star necklace on so many levels. Have a wonderful and peaceful weekend with your family. Wish upon a star is my favorite! Every time I see a falling star I make a wish. Crazy huh? Takes me back to my childhood…..laying on the grass at night watching the stars. The feather necklace is my choice. They are both so very special. Thank you for the opportunity to win! Wish upon a star at night and see the beauty in the skies! Wishing you a magical holiday season! Hi Becky, I’ve been admiring your work for awhile now and I love your blog posts ~ they are fun to look forward to. Especially in this season of hope, I love the wish necklace best; and I’m intrigued by your use of Mica, it’s such an enduring substrate. Thank you for bringing us into your heart and world through your blog posts. 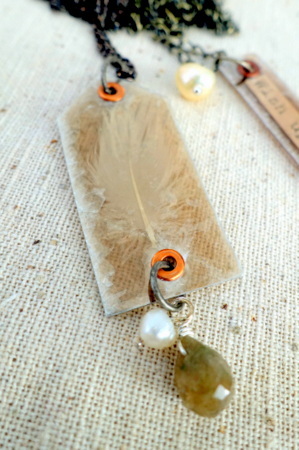 I love the feather necklace, it really caught my eye! Have a wonderful and relaxing weekend. It’s lovely to see more of your creative work and hear from you. I agree, there is so much that we have to be thankful for and 1st on my list is family, then health. I’m also happy that I got the fire under control in my friend’s oven on Thanksgiving day. The turkey dinner would have looked like a Chevy Chase Christmas movie. It was a very entertaining few minutes with everyone opening windows and fanning the smock out. Now about your generous offer, I love the “Wish Upon a Star” necklace. The song has special meaning to me. So, when you draw from that big hat, think Louie Coletti. He was my grandfather and always sang it to me. I remember a couple of unbreakable rules from childhood: never tell a lie and never play with bird feathers found on the ground cause they could have bird cooties. Oh, the fun I missed out on. I gather feathers now without regard to the cooties, but the only lie I tell is a little white lie like “No, those pants don’t make your rear look big.” However, I also grew up outside a lot and always without fail wished on the first star I saw not knowing it was probably Venus or Jupiter! 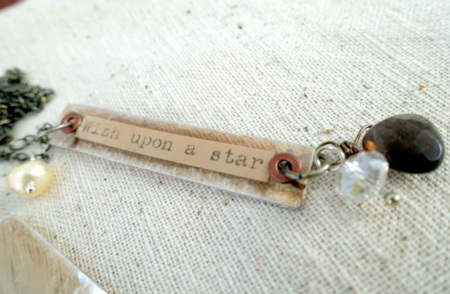 I would pick the Wish upon a star necklace if my name were drawn. Thanks. How thoughtful and generous of you, sharing your glorious creations with us. They are absolutely gorgeous!! Of course. Blessings to you! So grateful for the beauty you bring to our world. Oh , i Will win the tag with the feather …. But , the Netherlands are so far away . Well Happy Thanksgiving to you and your family. We, here in Canada, have had ours already. Lots to be thankful, too much to list. I do hope you had great food and family time. I love all your work, so I am going to leave this one up to you Becky. I like both pieces. 🙂 I found a feather from a Blue Heron this year and hope to use it on a canvas somehow. Thank you for the opportunity to win either one of these lovely pieces. 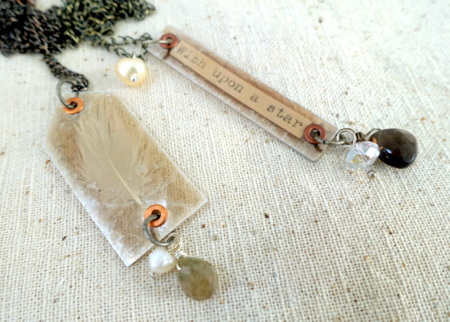 Both necklaces are so lovely Becky-but it’s the one with the feather that really resonates with me. Thank you for a chance to own one of your beautiful necklaces. I have been thinking of you too. With much gratitude for you, and the joy and light you spread with your words and art. Wish on a Star is such a magical thought from our childhoods when we were so innocent. A beautiful reminder of simpler, precious times. Your work is always so lovely that it warms to heart just to look at it. Best holiday wishes, Becky. These are beautiful Becky! As always your generosity is so precious! If I were to win, I would “hope” for the “Hope” necklace. As Emily Dickinson said, “Hope is a thing with wings.” Thank you. I love feathers, too. Just found a beautiful black one yesterday. If I’m lucky enough to win, I would like to have the feather necklace. Becky, I have several zines with your work in them. All are truly lovely. They are both amazing necklaces but my chose would be the feather necklace. Both necklaces are lovely, Becky! I gotta pick the star one. Growing up with a father who wore a Texaco star by day and later showed movie stars on a silver screen-I sure do love stars! Someday on a beach filled with stars-starfish that is and lots of feathers! Oh I hope I am just in time to enter still!